It was 60+ degrees and sunny – had been for weeks – in western Oregon, as I arrived in Eugene for the annual Public Interest Environmental Law Conference (PIELC) at the University of Oregon Law School – the planet’s oldest such conference. The conference, attended by over 3000 attorneys, activists, wonks and government officials, is put on by law students at the UofO. Other students from other top environmental law schools (Lewis and Clark, Vermont Law …) also pitch in organizing and moderating panel discussions. The organizers did a remarkable job juggling speakers, attendees and all the little things necessary. While suffering from a bigger than usual allergy attack brought on by many types of trees and flowering plants budding out at the same time; I, as usual, perused the conference brochure for panels and Keynote addresses that would take on the big eco-threats of the day. Out of over 200 panel presentations and twelve Keynote speakers, there were 1) three panels on citizen activism (two at the same time); 2) one panel on Consumption; 3) one panel on Population; 4) one on the “false solution” of “Green” Energy;…and NONE at all on Biomass/Biofuels! Not at all promising. The first sign that PIELC was headed down the rabbit hole was the Fund for Wild Nature’s panel presenting the Grassroots Activist of the Year Award. A grand total of five people attended as Arlene Montgomery was honored. Us five heard inspiring tales of how she and the two other women panelists have carried on with great success against all odds and little money. I found it quite an irony that the award was presented by Doug Bevington, author of the “Rebirth of Environmentalism,” in which he wrote that the was the model for grassroots activism in the 21st Century. No one from the high-budget, big green litigation shop was there at the grassroots panel, though CBD staffers dominated the conference overall, appearing on five times as many panels as any other group. CBD has perfected the suing to get endangered species listings and garnering millions in Attorneys Fees in the process. Yet, rarely is there any critical habitat set aside in these listing victories – rendering them hollow, at best. And, with the abject failure of the Clinton Option 9 Northwest Forest Plan to save the Northern Spotted Owl, there is deafening silence from CBD and the rest of the professional Endangered Species listings camp on an overdue Upgrade Petition for the owls, as Endangered, rather than the current more mild Threatened Status would result in real set asides – likely ALL old growth habitat remaining (8% of original, at best), if not all national forest lands in owl habitat – and the funders and Democrats will have none of that. The owls have no chance. In a way, Bevington sadly was right. CBD is a new model, not of grassroots activism by any means; but of how to become an undemocratic, well-compensated big green outfit masquerading as a citizen membership group quicker than any predecessors. McKibben was followed by Nabhan who gave a homily to Collaboration. He blithely used that false Einstein quote on the definition of insanity without any irony. He used it as a cudgel to beat those who would rather Resist than work in partnership with Gaia-destroying industries. He praised “Collaboration” efforts between farmers, ranchers and consumer activists and claimed a great victory in getting citizens in the Midwest to plant milkweed alongside their tomatoes in their gardens! He never once mentioned why the iconic North America insect, the Monarch Butterfly, has seen its milkweed breeding habitat disappear in the first place. The words “Ethanol” and “Monsanto” were never spoken. Nabhan, unfortunately, was not the sole presenter who had a “can’t we all get along/say nothing bad about the perps/we will cleverly wiggle our way out of it” worldview. An underlying “current” of the conference was that “wild” and “Wilderness” are no longer viable concepts. The future was all about geo-engineering schemes – the garden milkweeds were part of a pattern. I’ve always been astonished that the greens so eagerly embraced the very term “Collaboration” given its (rather recent) sordid history, but it IS the appropriate idiom. At a presentation on another pipeline, a CBD staffer lamented the attention paid to the KXL instead of his own project. While his put out motivation was jealousy, he had a point. While the entire “movement” has been distracted by the KXL effort, ALL the necessary pipes and more have been constructed and it has been very hard to draw attention to other proposed pipelines. The competition for Foundation grants is fierce…no can’t-we-all-get-along on that front. Vast numbers are paid to work on the KXL, coal exports, land use, natural gas exports, other pipelines…these are the growth sectors the budding lawyers are steered to. Follow the Money, as usual. The underlying causes are ignored or given little attention. After all, how could you have such conferences w/o massive carbon use? – Jet fuel is the number one end use of the Tar Sands, but you’ll never hear that at such an event. PIELC does get credit for trying to limit its footprint – in addition to having more video presentations, you won’t see a raft of used paper coffee cups overflowing trash bins – they are banned. And, while I question the efficacy, one can make a Carbon Offset donation to the great group Friends of Trees, who have planted close to a million urban trees in Oregon. Speaking of uses of trees, a glance at the school bookstore’s Law School annex display table showed ten books being promoted. Five were indistinguishable books on Climate; each had “Forward by Bill McKibben” on the cover. The best thing about PIELC is its commitment to Indigenous peoples. Native lands have paid an inordinate price for our energy addiction – in addition to the pipelines, there are uranium mines, coal mines, coal plants, Biomass schemes, etc. all across Indian Country. Oregon just approved Tax Credits (of course) for Biomass schemes on all the state’s nine federally recognized tribes’ lands. The most talked about Keynote this year was delivered by Xiuhtezcatl Roske-Martinez, a 14-year-old activist from Boulder CO. He is the Youth Director of Earth Guardians, a musician with his brother Itzcuahtli, a speaker at the RIo+20 United Nations Summit… and he has been concerned and active over Climate Change since he was six. The guy is a powerhouse. 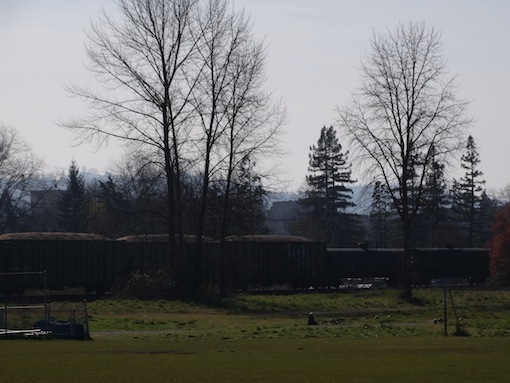 Chip and oil train parked on the tracks at the University of Oregon. I took a break and went down by the river to enjoy some sun – Eugene has a wonderful greenway along the river with bike paths on either side that run for miles. On the way back, the path runs under a railroad overpass. Sitting on the tracks was train loaded with dozens of cars full of wood chips and tankers full of Bakken shale oil – headed for the export docks. (Here was a direct action opportunity right outside the conference!) A few conference panels were on the oil and gas exports, yet none on the ground-up-forest ones. I was getting more and more depressed. The grumbling from grassroots activists was getting loud. My mood changed when I ran into my good buddy Calvin Hecocta. Calvin is a Klamath elder and spiritual leader. He was our Northwest chair of the American Indian Movement (AIM) back in the day. And, he was instrumental in the saving of the Opal Creek and Breitenbush Ancient Forests. I could go on and on singing praises to Calvin; suffice to say, he is one of the great ones. Friday night is the annual Indigenous Peoples Reception at the Many Nations Longhouse. The Law School is unique in that is has a beautiful student Longhouse out back and has a long-standing working relationship with the Longhouse and the tribes. Panel discussions on Native issues are held at the Longhouse during this and other conferences. The dinner of salmon, fry bread and other foods prepared by Native cooks was overflowing and a wonderful time. My mood got better. As a naked pyramid and dancers appeared around the fire with a big moon in the clear sky, I couldn’t help but hear Casey Neill’s “Dancing on the Ruins” in my head. This is the eyes-open community that always has been and always will be on the front lines – the activists who show up, paid only by a clear Gaian conscience and great camaraderie. While Derrick Jensen wrote and three different PIELC speakers I heard paraphrase “When hope dies; action begins;” I have to note that it is through collective action that there is any hope of hope. I didn’t stay up too late as I wanted to attend the sole panel on Consumption that was held at the early hour of 9am. It was put on by the wonky folks from the PolicyInteractive Research group that has interviewed thousands of people worldwide on environmental values. A case study of 16 low-carbon lifestyle people in the Eugene area was presented – the why and how they live such lives. A larger study was presented on just why pro-environmental values do NOT translate into pro-environment behavior. Denial – No problem, it doesn’t exist; nothing really matters, we are unimportant, love for the moment; the problem is beyond our ability to solve; I’m already doing my part (likely without much effect) – “I bought the Prius, what more do you want me to do? -; and, I’m working on something more important. We heard of a sociology professor who wrote a book on Climate Change concluding that “the problem is beyond our ability to solve.” And we heard of another UofO professor – a Climate Change professor – who commutes from Portland, over 100 miles away – in a high-end German auto! A friend recently posted on Facebook about feeling guilty about her carbon use and asked if others felt the same. The responses were 90%, “No way. I deserve it” or some other variance of the blind, New Agey “abundance” rationale. The sole other panel that looked at consumption and population was put on by CBD’s Population and Sustainability wing. CBD, in addition to distributing millions of free condoms with packaging tying it to species loss, seeks to break the taboo on talking about population in green circles. 7.3 billion Clever Apes consuming a finite planet is anything but “Sustainable” – by far THE most common word found in Panel titles. Shenna Fortner and Cedar Gilette. The highlight of the conference for me was the “canceled” panel on Indigenous Resistance to the KXL. With President Scott unable to attend, it was called off. But, over 70 people showed up anyway and it turned into a circle discussion (not the usual school lecture model by any means) on those perverse impacts on Native lands due to our energy addiction and consumer lifestyle. Shenna Fortner chaired it and started things off with a summary of the Rosebud Resistance to the Keystone XL and how one can plug in and help. Cedar Gillette, another Vermont Law student and tribal member from North Dakota, gave a powerful presentation on the human costs of the “man camps” associated with the fracking boom in the Bakken shale oil formations that underlie her nation. A staggering litany of domestic abuse, alcohol-fueled rampages brought some of the human costs associated with our energy addiction into focus. Good Shield spoke of the Buffalo Field Campaign – the longest continuous non-violent civil disobedience encampment in the nation. The BFC seeks to end the horrific slaughter of hundreds of Yellowstone Bison that is carried out annually at the behest of the cattle industry. And, Calvin Hecocta spoke from the heart about what has been lost. He (and others) talked about the days of the Clan Mothers. The highly-respected elder women of each clan would set about correcting anyone’s behaviors that worked against the common good. And tellingly, they also chose the leaders of the men’s councils. Calvin was chosen by the Clan Mothers at a young age to speak for the land, the birds, the mammals, the trees…and he does it well. He spoke to how all this degradation has occurred on men’s watch and it is time again to look to the grandmothers for leadership. With all the “logical” thinking and presentations going on all around, Calvin and others’ perspective was a breath of fresh air. 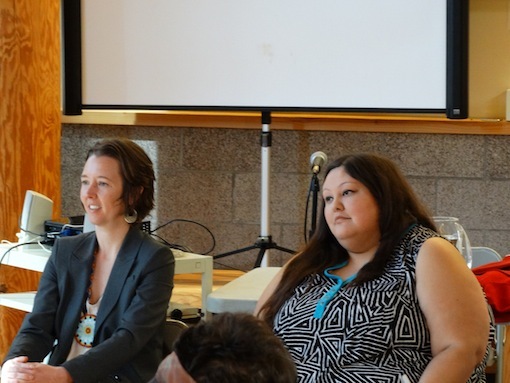 There were few dry eyes in the room – from Native women elders to young, white students…all were deeply touched. While the spontaneity was a big part of it, I’d still suggest that such a gathering be an integral part of ANY green gathering. While the many efforts against bad forest logging practices, GMO foods, fracking, pipelines, water, plastics, Indigenous survival, etc. are all well and good and necessary, little analysis can be found on the efficacy of already tried solutions, much less proposed ones. And, thus, the biggest elephant is the Renewable Energy Portfolios which require that a certain percentage (usually 25%) of the retail electricity in a state’s grid come from “renewables” by 2025. After hundreds of millions in subsidies (and blighted landscapes, roasted birds, etc.) the last eight years, wind and solar combined feed less than 5% into the grid (and there is evidence that even that 5% is not useable energy – useless without concurrent steam-generated Baseload power stabilizing the grid) we’re left with laws requiring 25% by ten years from now. And the major way the 25% will be met is with Biomass – the burning of forests for energy – the oldest (and dirtiest – 1.5x as polluting as burning coal) energy source of humankind. While some panels dealt with the across-the-board proposed increases in logging on public lands, the end game of Biomass is rarely mentioned. While Sen. Ron Wyden (D-OR though he lives in NY!) proposes “thinning” 9 million acres of eastern Oregon public forests, he and Oregon’s former governor helped arrange billions in loans for new Biomass plants to consume the “thinning.” Ex-Gov. John Kitzhaber even sold of 1500 acres of a state forest to a Biomass company! Kitzhaber was ultimately brought down by the sordid crony capitalism/influence peddling side of the “Green” Growth Economy. Pacific Gas and Electric’s (PGE) Boardman Coal Plant is Oregon’s biggest carbon polluter and it is on schedule to be converted from coal to Biomass by 2020. Just this week, The Oregonian reported that ex-Gov. John Kitzhaber’s forest adviser was the private owner of a timber consulting firm that benefited from Biomass deals Kitzhaber was selling State Forests and providing the Tax Credits to feed…plans the adviser was paid $400,000 by the State to develop! To her credit, new Governor Kate Brown immediately ended the contract with the adviser. Forests in the Amazon, the US Southeast and British Columbia are being turned into chips/pellets and exported to Europe where they are burned for electrons and the countries burning them preposterously get Carbon Credits for it which are then used to off-set the emissions from coal plants! Every day, one sees false memes overselling German solar energy; yet, never a mention of Germany’s Biomass energy use (expected to comprise 2/3rds of Germany’s “renewable” energy by 2020) and increased coal use. CBD is one of the many “green” groups that promote Biomass under the disproven rubric of thinning the forest to make them more fire-proof! CBD has helped plan the largest timber sale in Southwest history. They are hardly alone – Oregon Mild, errr, Wild signed on to Wyden’s plan and staffers appeared in a widely-disseminated photo with the senator and timber execs announcing their collaboration. One Oregon Wild staffer wrote a tortured defense of it (that has since been scrubbed from their website). McKibben is also a top promoter of his Middlebury Vermont college’s biomass plant. I’ll go so far as to say that Biomass is a greater threat to planetary life than Climate Change! Already we have copious evidence of entire civilizations going under due to deforestation. What could possibly go wrong at planetary scale this time? Ultimately PIELC is a Job Fair for eco-law students. It is not the more activist entity is started out as. In those days, grassroots activists, like Cyril Scott and allies, identified an issue and set up resistance to it. When needed, legal teams were assembled to carry out the paperwork resistance. Now, it is inverted with high-paid pro-Democrat foundation agents dictating eco-policy and even what issues are on the radar and fundable. It has devolved into a multi-billion dollars per year growth industry run by big foundations (whose wealth came/comes mostly from energy production), lawyers and Democratic Party factotums. Many “green” groups have annual budgets in the tens of millions – The Nature Conservancy alone (one of the proponents of Biomass) has over $20 billion in assets while dogged grassroots activists show up whether paid or not, often getting undermined (or their efforts fund-raised upon) by the big greens. During the course of the job fair, some 800 species went extinct. The professional Green Growth industry is a dead end. It’s way past time to walk the talk. There are NO Law Jobs on a Dead Planet. In the US, it should be a national security priority to save our coal, oil and gas reserves for our future needs. Selling our fossil fuel reserves now means future Americans will have to rely on nuclear power. These reserves should be socialized as a national energy bank, not privatized for bargain sales to China. Climate change campaigns should focus on this reality, rather than fantasies about renewable energy, which at best will only supply 10% of electrical demand. With 4 billion urban dwellers worldwide, living off-the-grid is not an option. Efficiency in electrical delivery can be vastly improved, but consumption is rising rapidly.